Nana draws her music's melodic color from the map of world cultures. She artfully blends sounds and textures from around the world. Her CD recordings include “After The Moon” and “Daughters Of The Sun” (Na Records), #1 on the NAV New Age and World radio charts. "She has succeeded in blending the products of various cultures…" claims German press. In 1984, Nana’s first album Pandora’s Blues won critic’s choice from DOWNBEAT Magazine. She later recorded two critically acclaimed releases on Germany’s Enja Records Wings and Air in 1987, Still Waters in 1989. 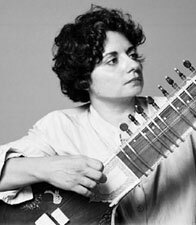 In 1992 B&W Music released the beautiful Gaia’s Dream.Nana plays sitar, bouzouki, guitar and sings in various languages. Performances include appearances with Oscar winner Tan Dun as a soloist on sitar in Marco Polo with the New York City Opera and the RAI Symphony Orchestra in Torino, Italy. She has also performed widely with her ensemble in venues such as the Montreux Music Festival and appears on their compilation CD Live at the B&W Montreux Music Festival, Vol. II. She has appeared at Symphony Space in the Wall to Wall Joni Mitchell event and performed at the Kennedy Center during the Mary Lou Williams Women in Jazz festival with the Mary Ann McSweeney sextet. She has written numerous commissions for dance companies such as former Pilobolus choreographer Peter Pucci, the Joffrey Ballet, American Dance Festival, Ballet Hispanico, North Carolina Dance Theater and Caryn Heilman, alumnus of the Paul Taylor Dance Company. She performed with her ensemble at Jacob’s Pillow last August with Heilman’s LiquidBody Dance Company. She has conducted and performed her original music with ensembles at the performances of Joyce theatre in New York, on Broadway and the American Dance Festival in Durham, North Carolina. Nana has also written filmscores such at the Domain of the Senses; Touch as well as scores for the theatrical productions of Antigone Through Time, presented at the New York City Fringe Festival and Conversations with the Goddesses, produced by Soho Repertory Theatre. She has written music for two musicals, An Absolute Mystery, which premiered at La Mama, etc., and Matrix Maison, presented at Dixon place, New York City. She also wrote the music for theOff Broadway show called American Dreams, Lost and Found which toured the U.S. and opened at the Lucielle Lortel theater in New York in May 2003. During this time the Acting company was given a TONY award for excellence in theater. Last July 14th her ensemble, World Music Of Nana, performed at Merkin Hall will Ustad Sultan Khan on sarangi and David Liebman on saxophone.